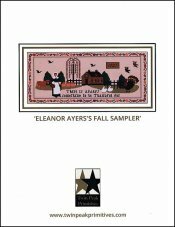 Eleanor Ayers's Fall Sampler [D6093] - $14.00 : Yarn Tree, Your wholesale source for cross stitch supplies. Cross stitch pattern by Twin Peak Primitives. The turkeys are gobbling, the ducks are quaking, the cows are mooing & birds are chirping. It's a cool morning on the farm, a perfect time to do morning chores. With pumpkins growing & leaves falling, Thanksgiving is fast approaching. There is much to be thankful for! Stitch count is 277W x 117H.